BodyMatter is passionate about bringing to you Organic Granola that tastes yummy and is made from wheat-free natural ingredients. Totally natural with no artificial ingredients or additives, no processed sugar or added salt. When Dympna, (Bodymatter's Founder) was advised to avoid wheat, cut down on the amount of sugars and fats, and eat more Low GI foods to help manage bloatedness and lethargy amongst other things she realised that it was a very tall order to meet for her usual crunchy breakfast cereals. So with the best great tasting organic ingredients she decided to start making her own. 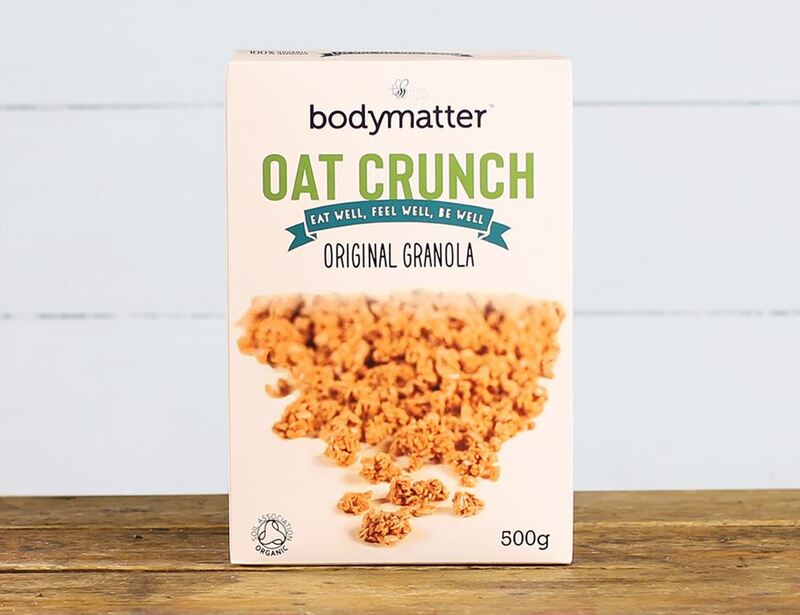 Bodymatter crunches are slow release and naturally stacked with vitamins, minerals, anti-oxidants, omega 3 6 9 soluble fibre and phytonutrients. They only use unrefined cold-pressed sunflower oil for less saturated fat and more vitamin E. A granola that the whole family can enjoy. * = produced to organic standards. For allergens, including cereals containing gluten, please see ingredients in bold. May contain traces of Sesame & Peanuts. Suitable for Vegetarians. Kosher certified. Nutritious and filling, this Granola can be eaten with cold milk, warm milk like a ready made porridge, yoghurt, sprinkled over fresh fruit, as a crumble or nibble straight out of the pack. Store in a cool dry place and make sure inner bag is properly sealed after use. Not suitable for home freezing.